I was wondering if anybody had any idea when this photo was taken and who the driver was? I am Percy Landers only grand -child. Landers had smallish pale blue Thames vans back in the early sixties. They were sign written in white. They were sign written thus:- ‘Bakers Boy’ and ‘Craigs Pantry’. I remember working on them in Landers Garage. Does anyone else recall these smaller rather attractive little vehicles? Pete. S., above, as mentioned previously, I worked with your Dad Clarence, a good man and true. You are right about the Landers paint shop etc, however the paint shop eventually moved up Woodhouse Rd a bit and relocated in Nursery St – ‘Do you remember that’? It was there when I left the company around Sept ’63. I knew many of the painters and sign writers at both locations – they were all totally professional and certainly a laugh a minute. (As were the garage mechanics and body shop lads!). Great days indeed! I can remember the transport department being on Oxford Street, the garage was on the left hand corner with Woodhouse Road / Leemimg Lane and if my memory serves me right the paint shop was further down Oxford St., on the right just before you entered the bakery site. One of the memories I have of the garage is my Dad Clarence Stevens introducing me to Albert Scanlon the Man Utd Footballer, but what he was doing at Landers I dont know. I used to spend Saturday mornings in that garage with Dad as we lived at 179 Yorke Street. Hi, is this the Percy Lander who recieved a MVO from King George in 1935? I am doing some family history of my son in law and there seems to be lots of Percy Landers around. Another story to come out of Landers Bakery was:- In 1963 I became very good friends of Mr J. W. Kaye and his father, Councillor W. Kaye. Mr Kaye junior opened a Self-service shop on the Ladybrook Estate in Mansfield. 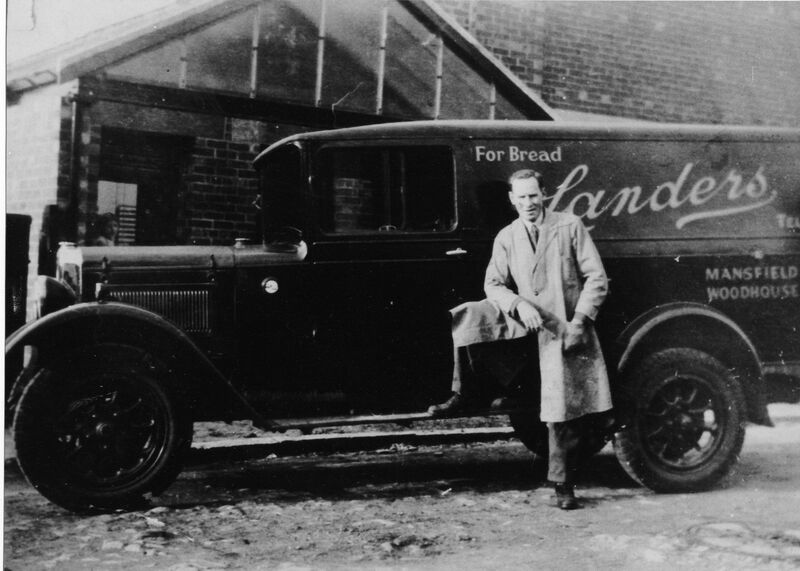 Landers became sole supplier for Bread and Cakes etc. And from this, a very strong friendship developed. I think it was 1964 that Mr. Kaye senior became Lord Mayor of Mansfield. During one of our many cups of tea in the store room, the Mayor said he would love to see the bakery. No problem said I, say the word I’ll arrange it and show you round. The date and time was arranged, and I made sure I was there ready. This was a meeting between the Mayor and I. How was I to know he would turn up in the Mayoral Car, and in his full regalia and chain of office. Edward Charles Morris the General Manager, did a double take. He spotted the Lord Mayor’s car. Panic must have taken over, “What on earth is the Mayor’s car doing here?” he cried. “Why was I not informed?” Once he knew who and why, the panic disappeared. It was made an official visit over tea and cakes in his office after I had taken them around the new oven and the bakery. I bet Jack Pearson never in this wide world thought that his picture would be on view to millions of people.. In his time there were none of the gadgets we enjoy so much today…In Jack’s time, with the few rounds there were at Landers, the salesmen had to write their orders in chalk on a blackboard for the next day….From being a salesman, Jack became a Supervisor, in fact he was the only Supervisor…. One whom Percy became most reliant. and so did Miss Rawlinson, Kathleen and Thelma in their hour of need….Jack pearson was a vital cog in the success of the Bakery before and after the death of Percy Lander. I remember Jack coming to the bakery in his old Singer car, parking it in the garage when the vans had all been removed. And this was in the late 40’s… Jack would make sure all the vans were out on time, and if there happened to be any absentees, Jack would jump in the van with a vanboy who would show him the round, in order that the deliveries would be made…He was the perfect employee that any company would love to have on their books… He was a very quiet person, well educated, knew a lot about business and motors, never raised his voice to anyone,” loved his pipe,” and was a very good friend to all. It is over 50 years since I last saw Jack Pearson, and would like to say it was indeed a great pleasure having him as a friend, and a big Thank You Jack..Where ever you are. I remember being on a delivery round in Nottingham when it was very very cold. I was driving one of the Ford Diesel Vans. The Diesel vans were in their infantsy and I believe were made by Baker Perkins. Guess it must have been in the late 50’s… In the cold , and Icy packed roads, The engine stopped, I tried everything I knew to get it going to no avail..I eventually found a phone to call the garage, and explained my plight. The reply came back, Alan, you are the 18th van to phone in, try and pour some very hot water along the diesel pipeline, the diesel has frozen,and when you get it going, go to a garage and put a gallon of petrol into the tank with the diesel…It worked. The diesel had solidified and could not be pumped through to the engine. After that when filling up with diesel,we had to put one gallon of petrol with it during the very cold weather. It stopped the diesel from freezing. A.C.
One of the really good things about being a Van Boy at Landers was, ” You learned to drive.” He would do a good job, then have a daily driving lesson, even if it was only driving the van back to the bakery. But you were taught by the best, and all this was free…. I cannot remember any Van Boy not passing his test first time. Ken Fearn taught me, and he didn’t have to pass a driving test,I believe he got his driving licence pre-1935 when you didn’t have to pass a driving test to have a driving licence. I knew Landers before I joined in 1949… Between The Black Bull and the bottom of Oxford St…. Percy had a large garage. a petrol pump with the hose coming out of a small opening at the top of a large window allowed the vans to fill up with fuel on Woodhouse Road…Inside the garage were two large pits, where the servicing and maintenance of the vans took place…In the beginning, all the vans had to be sqeezed into the garage to be parked overnight. Jack Pearson put his car in the garage during the day. In 1947, Jack was the only salesman to have a car… As the business grew the garage wasn’t big enough to house the vans, although some stayed in the garage others,had to be parked in the yard at the top of the street behind locked gates. Jim, just to add further to your question about the two Landers shops being 1 and 3… Most bakeries used wooden trays to carry their bread and cakes, mainly because of the bread being plain and unwrapped, also for ease of transporting to the shops. Percy always insisted that he had the best.Each round had it’s own trays with the name of Landers burned on the side, and the round number burned twice on each end of the tray. And for extra strength, and ease of sliding on the racks of the vans, strips of iron runners, about 1/2 ” by 1.8″ were screwed around both edges of the tray bending round the ends and over the tops of the tray for approximately 6″. There were no metal trays used at that time. I wouldn’t think the confectionary dispatch was were it is in the above picture in your time there. I believe it was moved to just inside the new very large parking garage for the vans, just to the right of the silos. However, the above confectionery dispatch room, (where Percy’s daughter Thelma spent a lot of time), was fitted out with numbered racks so each tray was placed in the rack of that round, for that round, with that round number, say 7. Therefore, Leaming St. Shop would have been packed on round 1’s trays , and likewise, Kirkby shop round 3. Surely there are some other ex-Landers people out there? A.C.
Hello Carole, First can I make a slight correction to my comment about Mr Jack H. Pearson. The photograph is definitely Jack, (he always smoked a pipe, and one can see in the photograph that Jack is holding it in his hand). The correction is, it was 67 Berry Hill Road where Jack lived, not Berry Hill Lane. I went there with Jack a few times. I do not think that Jack and his wife had any children, and I believe they moved back to Kirklington or Southwell after I moved to Cheshire. I do believe that Mr. J. H. Pearson was like your Grandfather’s right hand. Hello Jim, Puzzle no more, this ” OLD MAN ” in his 70’s or older, can come to your rescue !! … Before Landers really took off, as you rightly say, Mansfield shop was 1, Kirkby shop was 3…. This came about in the early days, Leaming St. shop was served by Round 1. The Mansfield round… Kirkby shop was served by Round 3. The Kirkby round..My very good friend Frank Bagley, who is no longer with us, ( he died when only aged 28 ), used to deliver Kirkby shop’s order.. He was on round 3…A lady with red hair was the Manageress of the shop…Frank served in Korea in 1951 At that time,there was no shop 2 It seamed that after after the purchase of Whiley’s Bakery In Woodhouse, ( Geoff Whilley came to work at Landers as a Salesman )… (I believe Geoff died last year. ) …Landers forged ahead with the opening of further shops…This may have been to counter any loss of trade to Supermarkets. The cakes from Landers were second to none. The opening of Church street shop and Queen street shop were soon to follow..We also supplied many smaller bakers with bread in there own wrappers. Probably the 60’s were the greatest period of growth for Landers and British Bakeries…Who were of course R.H.M. Rank Hovis McDougal. A.C.
Alan one thing that has always puzzled me is Leeming St shop was 1(or was till computers became involved then 801) and Kirby was 3 but no one knew what or were shop 2 had been, any ideas ? Many thanks for your information about this photo Alan – it means so much more now! Are you in touch with Jack Pearsons relatives at all? I don’t think it is Thelma in the window but it would be lovely if it was! I had forgotten about their shops! What a wonderful memory you have. Upon second thoughts, I recall, this van may have been used for Landers’ own shop deliveries at Leeming Street, and Kirkby Shops. The shop van was smaller and older than the normal delivery vans. Having said that some of the orginal vans were pretty old. You are taking me back over 60 plus years. A real trip down memory lane. The picture is taken outside the old Landers Confectionery Packing room, where the van salesmen collected their daily confectionery orders. ( As previously mentioned in my earlier comments.) One can see the two open windows where the confectionery orders were passed through. Many is the time that Thelma would check out your order through these windows. Also, one can see the rack full of wooden trays in the production department…It is my guess the picture was taken around 1940/5. The van was not there in 1949. The salesman I feel is one Jack Pearson, whom I knew for quite a few years. He worked for Percy Lander for many years, and when Percy died, Jack ran the sales side of the business. When the people from Park House. Manchester took over, poor Jack was kept on, but pushed to one side. Albeit a little younger. The man in the picture is Jack Pearson, I think he lived on Berry Hill Lane.Mansfield.